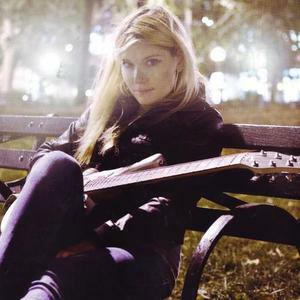 Marnie Stern (born March 18, 1976) is a musician, songwriter, and guitarist from New York City. She has garnered acclaim for her technical skill and tapping style of guitar play. Stern has cited many musical influences that contribute to her sound, including Hella, Lightning Bolt and Yoko Ono. In early 2007, Kill Rock Stars released her debut album, In Advance Of The Broken Arm. It was well received by critics, and most favorably by The New York Times, citing it as "the year's most exciting rock 'n' roll album. Stern has cited many musical influences that contribute to her sound, including Hella, Lightning Bolt and Yoko Ono. In early 2007, Kill Rock Stars released her debut album, In Advance Of The Broken Arm. It was well received by critics, and most favorably by The New York Times, citing it as "the year's most exciting rock 'n' roll album." In mid 2007, Stern toured the US and UK with Hella's Zach Hill and The Advantage's Robby Moncrieff in support of her debut album. In 2008, Stern was named one of Venus Zine's "Greatest Female Guitarists of All Time," in their spring 2008 issue, and was nominated "Female Artist of the Year" and "Punk Album of the Year" for the 2008 Plug Music Awards. Marnie Stern's second album, This Is It and You Are It and So Is That and He Is It and She Is It and It Is It and That Is That, was released October 7, 2008. Upon release, it garnered the title of "Best New Music" as well as #44 on "The 50 Best Albums of 2008" from Pitchfork Media. Stern toured Europe and the US in support of the album with former U.S. Maple guitarist Mark Shippy, bassist Malia James, and a varying lineup of drummers. Backed by bass player Nithin Kalvakota and former Tera Melos drummer Vincent Rogers, Stern spent most of 2010 and 2011 touring North America, Europe, and Australia in support of her third, self-titled album. She is currently recording a new studio album.